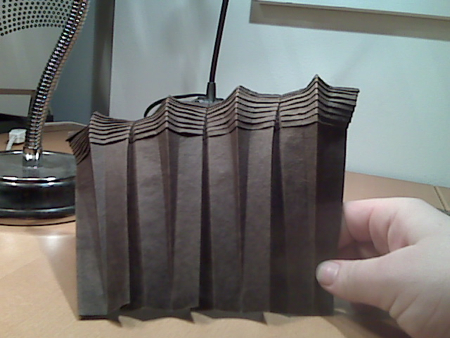 I’m still folding paper – see some of the work at the end of this post! But I’ve just started taking GMAW/MiG welding classes, and it’s a lot of fun. I’m looking forward to learning some metalworking skills and applying some of my love for geometric design… and seeing what comes out of the combination! I have a lot of fond memories of my grandfather working in his shop welding things, and my first attempts at welding tonight (while messy) made me feel a connection with him, and it was a happy-making experience. And then this – my first exposure to a computer-controlled plasma cutter! It was love at first sight! I have, however, been doing work in paper as well. I took a week in early February and went on a personal “art retreat” in NYC, and I was able to get some interesting work done. I also came away with a lot of ideas for new work, which is still continuing. Here’s a design for a bowl (of all things) which I am still refining, to be completed in some wonderful multi-hued blue handmade flax paper. Please forgive the quality of the photos here, I was taking photos during the build process for my own reference. Here’s the blue flax that I’m intending to use, from Cave Paper in Minneapolis. The paper has a delightful roughness to it, with an uneven deckled edge that should really make a great rim to the bowl. I’m looking forward to the final version of this; I just have to make sure that I calculate everything properly, as I only get one chance to make it, and it’s going to take three sheets of the blue flax to do it in the proper scale. If anyone has a good suggestion for a clear and strong glue, please let me know. I haven’t found any satisfactory “connecting” materials yet, which is also holding things up a bit. Ideas welcome. 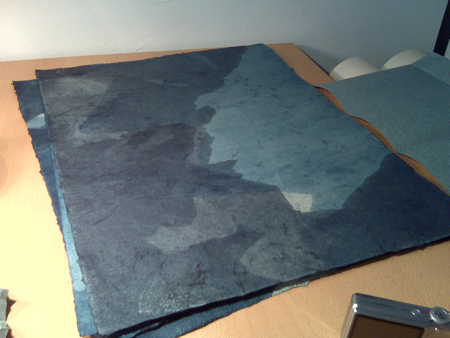 I use 3M’s Super 77, Multipurpose Adhesive spray to glue two sheets of handmade (or other) paper together. I’ve even made a triple layer. I’ve never had any problems with it. It holds up under lots of creases and layers, and the edges of the paper never come undone. It can easily be found at craft stores, such as AC Moore of Michaels. Hopefully it will work well for your application. I’ve thought about using something like that with a thin strip of the same material, to glue the two ends together; I’m only worried about it being too thick. I suppose I’ll have to try it and see how it works out. nice origami design. Very interesting design.